PRIVATE INVESTIGATOR PHOTO CREDENTIALS, which includes an authorization for screening and the completion of your criminal records registration application. 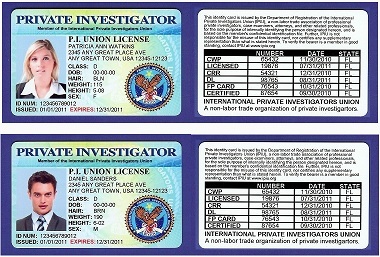 The PI Union License is a one-time set-up payment, and will be renewed for FREE if you keep your regular IPIU Membership current from year to year. Internet Access to the IPIU Web site is required. If you have not purchased either an Economy or Professional Membership Plan, then you can do so at this link: CLICK HERE FOR MEMBERSHIP PLANS (Annual Membership Plans can average as low as $8.00/month). If you have urgent matters that cannot be taken care of by e-mail you may reach Agent Relations by phone at 406-534-0251 Monday through Thursday 8:30 AM to 4:30 PM MOUNTAIN TIME.